Bright and airy 2 bedroom, 2.5 bath duplex Penthouse Loft. The entry hall with the powder room leads to an open Living / Dining room with high ceilings and new oak flooring, a wood burning fireplace and a wall of glass with access to the private set back terrace with superb river and city views. The open chefs kitchen has a center-island, Corian countertops, abundant custom cabinetry and top of the line Bosch, Wolf and Sub-zero appliances. Upstairs the master bedroom with wonderful views has a glass-enclosed limestone spa bathroom with open rain shower. The sky-lit second bedroom has access to a handsome bathroom. The apartment has a washer and dryer and central air conditioning. 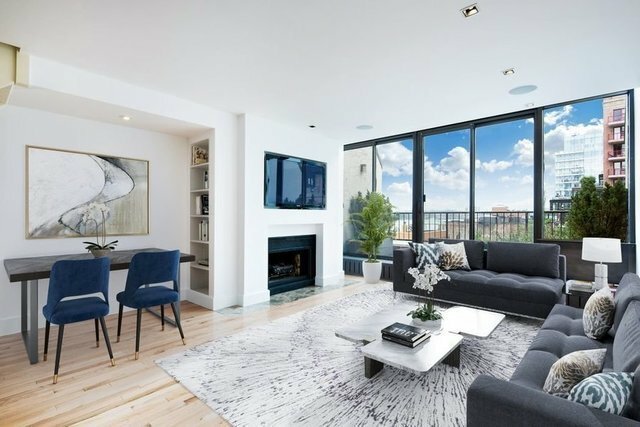 130 Barrow Street is an award winning loft building with a live in super, and a new large landscaped and furnished roof deck with great water and city views. Photos are virtually staged.